Chocolate today is recognised as a contributor to health and well-being, as long as you choose the ‘healthy’ chocolate options. Cocoa solids are the best way to judge the quality of your chocolate. Chocolate is made from sugar, fat and cocoa beans that have been roasted to release their flavour and then ground to produce chocolate ‘liquor’ which is about half finely ground cocoa solids and half cocoa butter. This liquor is then processed to form cocoa solids. Chocolate also contains sugar, milk, lecithin (from egg yolks, used to stabilise the ingredients), vanilla or other flavourings and so on. A bar of chocolate produced in the EU or the USA has to be labelled with its cocoa content – but this may tell you either how much of the bar’s weight is comprised of cocoa solids (with cocoa butter) or may say cocoa ‘mass’. If the label says ‘cocoa solids’, it means both cocoa butter and the dry cocoa particles which can also be called powder. When buying chocolate the percentage of cocoa solids and sugar combine to determine the quality (and taste) of the chocolate. The higher the cocoa content and the lower the sugar percentage, the more chocolaty the taste will be. Most people agree that a good plain, dark or bitter chocolate should contain at least 70% cocoa solids to produce the right blend of mouth-quality and taste. However, you can obtain up to 100% cocoa solid ‘chocolate’ which is used for cooking but actually is almost impossible to eat in its solid state as it is both bitter and dry. You can judge chocolate solids in a bar by listening to the sound it makes when you snap it – the crisper the sound the more the cocoa solids in the bar – high fat or high sugar chocolates tend to break less cleanly and sound less snappy. Good quality chocolate will also melt very swiftly, because cocoa butter actually melts at a temperature just below the natural human body temperature. Of course all this depends on the type of chocolate you have chosen. 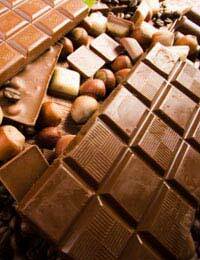 High end white chocolate is usually only made up of around 30% cocoa butter with very little or no cocoa solids. Poor quality chocolate can actually contain as little as 7% cocoa solids and may have a high percentage of vegetable or even saturated fat which is less healthy and less appealing to the palate. It contains vital trace elements and nutrients such as iron, calcium and potassium. Good chocolate, high in cocoa solids, also has vitamins A. B1, C, D, and E.
Cocoa solids are very high in magnesium – the deficiency of which can contribute to high blood pressure, heart disease, diabetes and joint problems. Magnesium deficiency is also a major cause of pre-menstrual tension (PMT). Increasing the dietary intake of magnesium contributes to a woman’s pre-menstrual progesterone levels and that reduces the emotional mood-swing element of PMT. Lindt have chocolate bars with 85% and 90% cocoa solids and these are sold in my local supermarket and are for normal eating. This weekend a neighbour gave me a bar of Lindt 99% coaco solids chocolate bar this is also designed for eating normally (see tasting advice in the packet). there fore I can not agrre with your topic about high % cocoa solids only being used for cooking!!! !